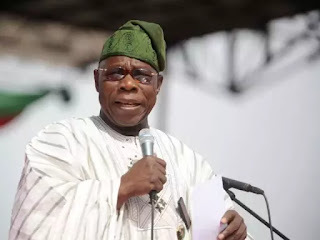 The former President Olusegun Obasanjo has turned an economist with his endorsement of Minister of Finance, Mrs. Kemi Adeosun despite increasing recession bites and clamour for her removal from the Minister, reports ITRealms. Speaking Tuesday at the ongoing National Council on Finance and Economic Development (NACOFED) in Abeokuta, Ogun State, Obasanjo expressed optimism that things will soon be better in the country, and said that Mrs. Adeosun is steering the economy at a difficult period, saying time will soon prove her right. Also speaking, the Minister of Finance, Mrs. Kemi Adeosun reiterated the resolve of the present administration to use the opportunity created by the current economic challenges to put the economy right structurally once and for all in setting this nation back on the right path. Giving the keynote address at the event opening said "Underperformance can no longer be tolerated as the oil revenues that insulated us from the impacts of this consistent underperformance are no longer available." The current administration, she said, has set out a robust plan to reposition our economy to ensure that what we are experiencing today will never recur in the history of our nation. She disclosed that the Federal Government realises the fact that Nigeria’s size, national endowments, population and future needs demand that this economy perform at its optimal potential which it has yet to do in its 55 plus years of independence. Adeosun explained that the drive for the economic turnaround is being led by the effective management of public money which will act as a magnet for the mobilisation of private capital. "We have committed to changing Nigeria from an economic model that was driven by consumption to one that is driven by investment. We recognize that in the short term this is causing a dislocation as we redirect funds from recurrent day to day expenditure to the much needed capital investment that will drive our economic future. Nigeria’s vast economy can only be productive and profitable when it has the enabling infrastructure needed to unlock its much vaunted potential. Our economic plans will provide the link between our potential and our future," the Minister said.